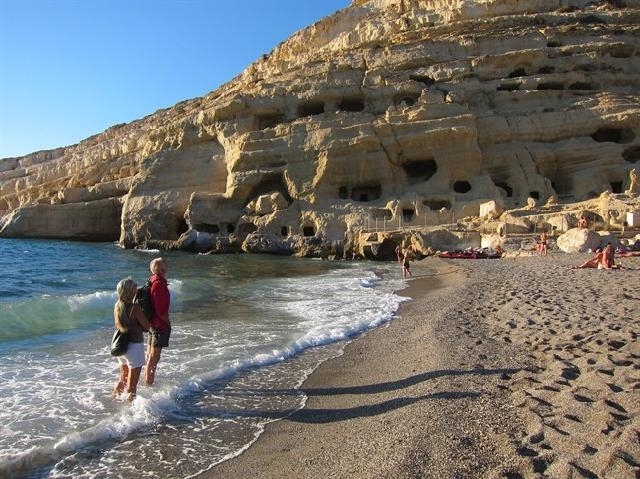 Hippy era gives boost to Greek island village where Joni Mitchell slept in cave..
MATALA, Greece - In one of Matala's ancient caves Joni Mitchell had a bad night's sleep. The Canadian folksinging icon joined a wave of hippies from around the globe that washed ashore at this village on Crete's south coast in the late-1960s. A key attraction: the sandstone caves at the north end of the beach that provided free accommodation. In published photos of the time, the hippies look as if they've occupied some bizarre prehistoric hotel as they lounge outside their cliffside dwellings. These days swimsuit-clad tourists clamber up ledges on the cliff to explore the caves all day long. Access is free. "The fact that Joni Mitchell was here, and all the hippies, I think it makes Matala an attraction for the tourists," says Luigi Sirianni, 32, one of several vendors who set up tables of handmade jewelry every day on the beach. "But there is a powerful energy in this place. If not, people would stop (coming)." More than four decades after the hippy invasion, this Greek village continues to cash in on the 1960s legacy that has become its brand. Swirly, psychedelic-style images are painted on roads and laneways. Gift shops do a brisk trade in flower-power stickers, T-shirts adorned with peace symbols and shoulder bags reading, "Hippies do it better," along with bottles of olive oil and raki, the potent liquor downed commonly on Crete after dinner — and pretty much any other time of the day. On a warm Saturday night in late-September, a barefoot musician sat cross-legged on a platform outside a cafe as he performed on electric sitar, harmonica and Apple laptop before an appreciative crowd. "Business here is very good, and anyone who says it isn't is lying," says Voula Hristodoylaki, 52, who has owned a bookshop in the village for 30 years. "It's not tragic everywhere in Greece like they say on TV," she says, referring to the country's depressed economy and weakened tourism industry. A three-day festival with round-the-clock music drew over 50,000 visitors to Matala this past June. Inaugurated in 2011 as a hippy reunion, the event will be staged annually, organizers say. Coverage by international media of the 1960s cave-dwellers led to an immediate boom in what was then a sleepy fishing village. Hotels were developed, bars and discos opened as tourists came to see a place that was certified groovy. A Life magazine cover story on Matala in July 1968 quoted a young man from Los Angeles who said, "You come to the caves to clean out your mind, and nobody bugs nobody." Mitchell immortalized her stay here in her 1971 hit song Carey: she said her fingernails were filthy, she had beach tar on her feet and she missed her clean white linen and "fancy French cologne." "The wind is in from Africa, last night I couldn't sleep," the song begins. Well, no wonder. Try sleeping on hard rock in a dusty tomb. The Romans used the 60-odd shallow caves, some with antechambers and three-metre-high ceilings, as burial places after occupying the island of Crete more than 2,000 years ago. A sign identifies the cliff face as a "Roman cemetery." Earlier, Odysseus is said to have dropped by on his return from the Trojan War. And legend has it that the god Zeus also showed up on Matala's beach. But Zeus doesn't hold a candle to Mitchell, whose name crops up most often in local folklore. Spiros Panagakis, 56, one of the festival organizers and a longtime Matala resident who keeps a copy of the Life magazine article pinned to a wall in his home along with photos of Jimi Hendrix and Joan Baez, says there was small cafe at the beach called the Mermaid. "Joni Mitchell went there every night with the local people, with hippies, with fishermen." Offering a morning visitor a shot of raki on his sunny patio, Panagakis points across Matala's bayfront to what locals in the know have told him was Mitchell's personal abode: "She was in the big cave there, near the fallen rock." Asked whether some tourists might appreciate a "Joni Mitchell stayed here" historical plaque at the site, he says: "This is not a bad idea, but it's an archeological area and we cannot do this. That's the problem." Taking up residence in the cemetery would also now be a problem, although if someone wanted to pass a night in a cave for a lark no one would mind, Panagakis says. Some of the jewelry vendors, who've been labelled the "new hippies" of Matala, inhabit a more remote set of caves not far away. All the commercialism in Matala's streets may seem to be at odds with the hippy ethos, if there ever was such a thing, but visitors appear unfazed. "The spirit of the hippies is still here," says Stefan Joven, 38, of Munich, Germany, part of a yoga group camping on a secluded beach east of the village. A message in big blue letters painted on Matala's seafront wall in 1969, and repainted every year since, has become a local motto: "Today is life, tomorrow never comes." Standing in what is supposedly Joni Mitchell's former cave, Joven says the words have resonance. "I am trying to live that way, to stay in the moment and not think about tomorrow."